The document has been set up by Kaj Beuter, who is based in Darmstadt in Germany. It is directly addressed to the IOC President Thomas Bach, widely criticised after the Executive Board declined to impose a blanket ban on Russia from Rio 2016. It asks the IOC to consider allowing Stepanova to participate “in appreciation of her efforts to reveal one of the biggest doping scandals in history”. A separate campaign, launched by World Anti-Doping Agency (WADA) Athletes' Committee chair Beckie Scott, has raised nearly CHF32,000 to help Yuliya and husband Vitaly Stepanov "rebuild their lives" in the United States. But the IOC decided the 30-year-old should not be able to take part in the Olympics after they imposed a ruling on eligibility of Russian athletes which excluded those who have previously served a drugs ban. The IOC, who referred the decision to the Ethics Commission, recognised her contribution to the "fight against doping" but said they took into account her "own long implication, of at least five years, in this doping system". The IOC Ethics Commission also factored in "the timing of her whistleblowing, which came after the system did not protect her any longer following a positive test for which she was sanctioned for doping for the first time". The choice not to clear Stepanova to participate as a neutral athlete sparked condemnation in numerous circles, with the World Anti-Doping Agency (WADA) admitting they were “very concerned over the message that this sends for whistleblowers in the future". “Despite of the fact that there is evidence for massive systematic doping Russia has not been banned from the Olympic Games in Rio,” the petition reads. 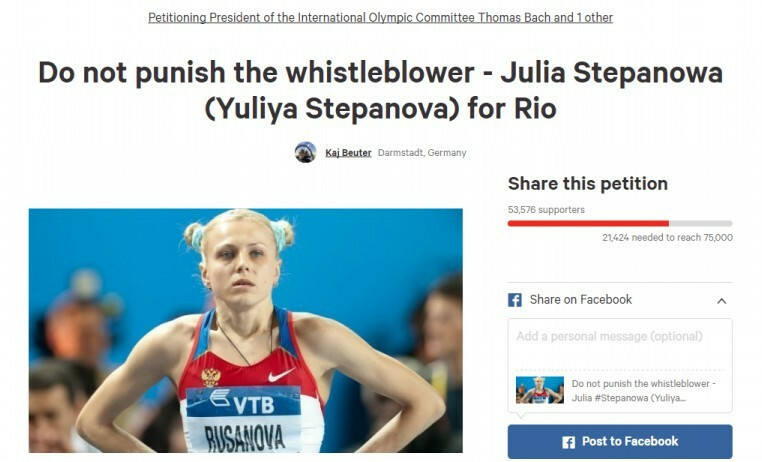 The petition on change.org is one of two campaigns established in support of Stepanova. Scott, a former cross-country skier who won an Olympic gold medal at Salt Lake City 2002, is behind a similar scheme on the “I believe in You” website. The Canadian wants to help “provide assistance” to the Stepanovs “to help them get back on their feet” by raising a total of CHF80,000 (£62,300/$82,500/€74,000). The money will be used to aid with their living expenses “while they await legal permission to work in the United States". It will also be used to help further their educations so they can secure employment. So far, CHF 31,799 (£25,000/$33,000/€29,000) has been raised through public donations. “Yuliya and Vitaly have perhaps made the greatest contribution ever to clean sport," Scott said. “We need to stand behind them and show our support. The change.org petition can be signed here and donations can be made through Scott's petition here.